Khoya Khoya Chand jumps from sub-plot to sub-plot showcasing only the end result in each case and not the process that led to it. It feels like the crew took a break after each sequence and the loss of continuity shows. While the songs reflect the charm of the 50s, you might be better off just listening to them. The characters do things abruptly, the story leaps from one point to the next without giving the audience any clue. It reads like chapters of a book with each chapter ending in a cliffhanger. However, when you start the next chapter you realize that the cliffhanger was not such a big deal after all. I don’t want spoon-feeding, but some hint of the transitions that the characters and their relationships are making would give the narrative a much needed flow. Soha Ali Khan, Shiney Ahuja, Rajat Kapoor, and Vinay Pathak are all good actors. But, here they come across as just going through the motions. It can be claimed that the movie is not really a story but just a comment on the lifestyles of the people it is about. But, for that to come across too, a certain amount of insight into the character is necessary. 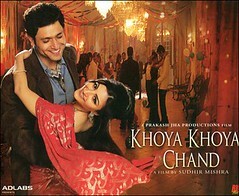 Khoya Khoya Chandrevolves around Nikhat and her relationships. But by the time you have figured that out, you have lost interest. Mainly because the screenplay meanders around trying to show everyone's point of view. I usually enjoy movies/stories narrated from various points of view, but here not one view is fully fleshed out. Even Nikhat's character doesn't seem completely thought out. Isn't it a shame that after spending over two hours with Nikhat you have no clue what she feels for the other characters in the movie? Or is that how she is? Clueless about her own relationships? Either which way, you couldn’t care less. The chops from one scene to the other are also very distracting. Before you can sink your teeth into what a character is trying to say/do/feel you are led straight into the next episode. I very rarely question why a person falls in love with another person. You know - "love happens". But, after having blindly accepted that, I think I deserve a peep into how the couple spends time together and how they grow apart. Nope, no such luck. I am just told, by way of plain dialogue or glycerin-filled eyes what transpired after the last scene. Khoya Khoya Chand is also about emptiness in the lives of people, more specifically of people that work in the film industry. It also shows the fallibility of the "stars" as people who are portrayed larger than life in reel-life. The irony is staring you in your face. Uh...so what? We know that. Our "star" who played the oh-so-lovable Munnabhai is in and out of prison for being involved with terrorists for goodness sake! However, I'd like to thank the director for taking us to the charming 50s-60s. (Except for the title song - which is the best, but it seems a little modern compared to the setting of the rest of the movie.) Especially the songs - music, lyrics, presentation. The music and lyrics are truly refreshing. Yet, I saw no specific reason for it to be set in the 50s. It might as well have been a present-day story. True, there are tributes to various actors, directors, music directors of that era. And there certainly must have been a few that I missed because I am not completely aware of what was happening in the personal lives of people from that era. Any which way, I found the lives portrayed very one-dimensional, very ordinary. And the other technical aspects are extraordinarily bizarre. The light seemed to be coming in from the weirdest places and gave many scenes a very artificial look. There were way too many close-ups and almost no on-location sets. It made me feel like I was trapped in low-budget Bhansali-land. And when the camera wasn't closing in on faces, it was going around in circles for no particular reason. More so, towards the end of the movie. Put together, they didn't create any impact at all. And what exact purpose were the time-transition title cards serving - "One month later", "two months later"? Were they supposed to imply that whatever was shown after the last title card happened in one day? However, the title cards in the end said loud and clear, "this is where we ran out of money, so sorry - story finish. khel khatam, paisa hajam (money digested, game over). Tata. Good bye. Go home." Haven't seen a more abrupt ending in the recent past. As I write this review, I am running through the movie again and again. It's a Sudhir Mishra product. There must be some larger point, where is it hiding? Or maybe the point is to show the pointlessness of existence. If so, it doesn't interest me, and so this one was clearly not for me. Parental guidance: When there is a good chance that adults might get bored, I doubt children are going to sit through it. Besides, the story is about adult relationships. Visually there are a couple mild love scenes. Nikhat (Soha Ali Khan) is a struggling actress. Prem Kumar (Rajat Kapoor), a top-rated actor takes a fancy to her and gets her a role in a movie opposite him. Zaffar (Shiney Ahuja) is a writer who likes Nikhat too. 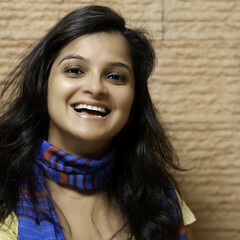 Shamol (Vinay Pathak) is an Assistant Director. The story is about Nikhat and her relationships with these men. The way the camera moves with the shuttlecock during the badminton game. The way the dirt is cleaned off by the wipers of the car, as if symbolizing a new start for Nikhat. But that thought is not taken further in the plot. The entire scene where only Nikhat's back is shown. You can see her face only in the reflection of a mirror. Very nicely done. The use of blue screen in the scene after Prem Kumar announces his engagement. The lighting in the car scene with Nikhat and Zaffar. Khwaab ho tum ya koi haqeeqat from Teen Deviyan (1965) was playing in the background. A little while later a song wishing you a happy new year in 1965 was shown as a part of the movie. The love making scene between Zaffar and Ratnabala was shot very shabbily. Soft-blurred-focus with the camera making circles - looked really bad. Nikhat is shivering from drinking too much and barely able to stand in one scene. And in the next she is walking about with all confidence - straight and poised. The twists in the end - all too late and attempt to bring in a story. Shamol seemingly cares a lot for Nikhat. He allows her to drink when she is so ill.
Why do Shamol and Zaffar who are such good friends start calling each other names in the end? Nikhat is shown taking a face steam. But her face shows no sweat! Slow motion in the scene where Nikhat is leaving Sharda's home, why? Nitin/Chakpak has posted 1 comments and has rated 0 movies. See Nitin/Chakpak's page for more details. O-ho, Morph, we agree on a movie! For the split second between when your comment was downloading in my inbox and when I read it, I was thinking, "wonder what Morph liked in this one?" I completely agree with you about casting too. The side effect of agreement though is that there is no further discussion, all we can do is some general movie-bashing. Where's the fun in that? Sana, somehow the movie didn't work for me. Just being unpredictable is not enough. What uncovers has to somehow have relevance with the rest of the movie, which doesn't quite happen here. Thanks for the comments Morph and Sana! @Rahul well, if they are any certificates, i am exposed to world cinema and also did the film appreciation course at FTII, Pune 3 years ago. I hopefully have learnt over the years and become a better reader of films. Maybe just maybe, if I saw the film again, I'd like it a shade or two better, but there are so many other films that I haven't seen, and somehow I don't think a second viewing is worth the effort. I appreciate your take on the film. But, if a movie doesn't make me feel like watching it again, it has said what it has to say to me, right?